Personalised stemless wine glasses are the perfect way to mark a special occasion such as a birthday, wedding, anniversary or any other celebration. They are ideal for giving as a present or for use in a bar or restaurant and are available in a variety of designs tailored to your unique and often bespoke specifications. Most companies will provide three services for stemless wine glasses. Firstly you can usually choose from an existing design. This could be to mark a 40th birthday celebration, wedding or simply to say ‘Happy Birthday’ on the glass. Secondly you can opt for creating your own design; this can be both text and art. This is often the best option for creating a truly bespoke glassware design. You can usually choose your own message alongside a pattern or design. Some companies will have the option to upload your own artwork or choose from their database. This gives you the chance to get really creative! Finally some companies offering branded glassware will also give you the option on the packaging. This can be made to match your glass design, ideal for giving as a present. How much does it cost to order personalised stemless wine glasses? This really does vary from company to company. Usually discounts will be offered if you order in bulk however you may be charged a ‘set up a charge or fee’. This is normally a one off payment for the glass design and labour, and then each glass is priced singularly. This is ideal if you are ordering bespoke stemless wine glasses for wedding favours or a birthday celebration. Prices vary with each personalised design. Multi-colour designs will cost you more as will intricate designs. Most companies will also have a minimum order requirement so make sure you read the small print. Remember to leave enough time for your glass to be designed, printed and delivered; some companies can take up to 6 weeks so planning is definitely required. Why personalise a stemless wine glass? These glasses are extremely functional and useful for serving wine, water, soft drinks and for use as a unique dessert glass. 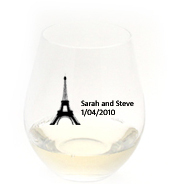 As well as this personalised stemless wine glasses are the perfect way to put your own mark on memories! You can make each glass meet your exact personal preference in design, colours and wording. Dartington Crystal – Dartington Crystal offer a fantastic service for personalised glassware. You are guaranteed high-quality engraved glassware. Overstock – if you are after contemporary yet traditional stemless wine glasses then browse the Overstock website. You can order personalised stemless wine glasses engraved with a letter from A-Z perfect for a simple yet elegant present. Out of the Box Gifts – Out of the Box Gifts offer a great range of personalised stemless wine glass options varying in design and style. If you require any other assistance with personalised stemless wine glasses then please contact us today! We can advise you on the stemless wine glass design for your wedding favour or birthday gift and together we can make your glass one of a kind.